1. Check the manufacturer. Before you buy any phone, I will recommend you checking the producer of the particular phone you want to pick. This is because there are some manufacturer that are know for best quality. But now there are instances where a particular product is produced, like an android phone produced in China by Samsung cant be same android phone produced in Korea by Samsung though is same modern. 2. How durable is the phone: ranging from screen, touch, charging system, water or liquid resistance. In our subsequent write up we have covered extensively the issue of screen and touch screen. This is one thing you have to consider before picking phone. You can read the detail here. 3. The price compare to the quality. There is one common thing about us, we see price range in everything. We believe that $100 smart phone can be better than $70 smart phone. This is not true about smart phones. Some smart phones quality are not determined by price. 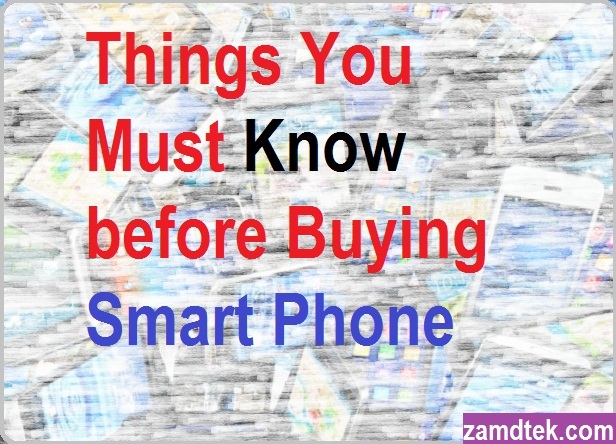 So, is important that you ask expect before picking a smartphone. A phone that sold $500 at launching centre remains same quality even when the price drop to $200. Quality is better than quantity because a quality phone will last longer. 4. The specification (special features). Some people are addicted to smart phone. So what are the special feature you like about phone. Me I love quality LCD so I go for samsung. The special feature you like will make you go for special thing. I love BlackBerry because the battery last longer when you are on hotspot. So what do you like about phones? 5. How to connect the phone to other devices like Bluetooth, NTF, ‎EXTERNAL AUDIO. We receive a complain one day that after connecting a newly bought phone to external audio sound system the phone automatically off. This phone never power again. So my intake here before you buy if you can't see expect ask people that have used the type of phone before. 1. Check the charger power rating in case your charger burnt. When you buy a new phone, if i were you is to check power rating of the charger or adapter. Different phones have different power rating and if you want your battery to last longer you should stick to the power rating of the charger. So observe the charger very well, you will see where it was indicated as the power output of the charger. If your phone charger is 4.2V 2A, using 3.7V 1A is shorting the life of the phone. 2. Install the necessary apps. We discuss in this website the Top Ten Must Have Apps in every android phones. There are some apps that you cannot do without. Having apps is one thing but having necessary apps is the best thing. Check below to see apps we recommend for you and why we did. 3. Uninstall the default unnecessary apps. Applications to me in phones is just decoration. If you have apps that you are not using why is it occupying your phone memory. There some apps in your phone that has been idle since you bought the phone. You have many games and apps on your phone but is only few you make use of. 4. Use the phone at least to play games and browse for some hours. The battery drain of most phones occur while you are surfing or browsing the internet. So phones mostly android can only get hot when you turn on the data. If you buy phone new, you have to browse for hours continuously to see it the phone will malfunction. 5. Check if it gets hot while charging. Depending on the type of power supply you use. Is advisable to the check your new phone temperature while charging. Some phone not only get hot while charging but also cant charge quicker unless you power it off. Check How to solve Hotness in android phones.